In addition, Peace Road from Route 64 west of Sycamore northerly to Plank Road and Plank Road northeasterly to Kane County Line is posted for 73,280 pounds with a maximum axle load of 18,000 pounds. DeKalb County may, after review, issue permits to move over permanently posted roads. To apply for a permit, interested parties should call the DeKalb County Highway Department at 815/756-9513 between the hours of 7:00am to 4:00pm on Monday thru Friday. All issued permits must be in the vehicle making the move and all restrictions on the permit must be adhered to. 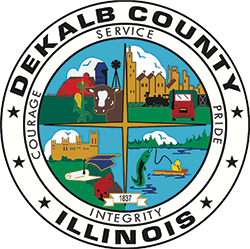 DeKalb County charges a $5.00 administrative fee for all permits as well as a per mile/per trip charge for overweight vehicles traveling on the County roadway system. For permits needed for posted State, township or municipal roads, each individual governmental authority having jurisdiction over their roads must be contacted, the County Highway Department only issues permits for County roads.